Winners for Gina Rarick from the 2018 season. Time flies, and so it is the moment for a quick look back at the year that was 2018. We had 151 runners this past year, and 80 of them came home earning some money; Twelve of them won, and our total yard earnings topped 400,000 euros for the first time, finishing at 410,258. We never have more than 18 horses in training at any one time and started a total of 31 different horses. That makes those numbers something our team can be proud of. We had some sales-ring thrills this year, too, watching Ardara Belle top 200,000 euros in the Arc sale. In the 10 years that I’ve been a public trainer, the numbers have improved every year. We have every expectation that the trend will continue in 2019. We have some very interesting horses in the yard at the moment, and the search for even better performers never stops. But nothing can happen without our owners, and this is the moment to say a huge thank you for coming aboard and having the faith to stay aboard! We are going to put every effort into making 2019 a truly spectacular year for our yard and our owners. As you all know, French racing is struggling and after next year there will be some serious questions about prize money and the situation going forward. 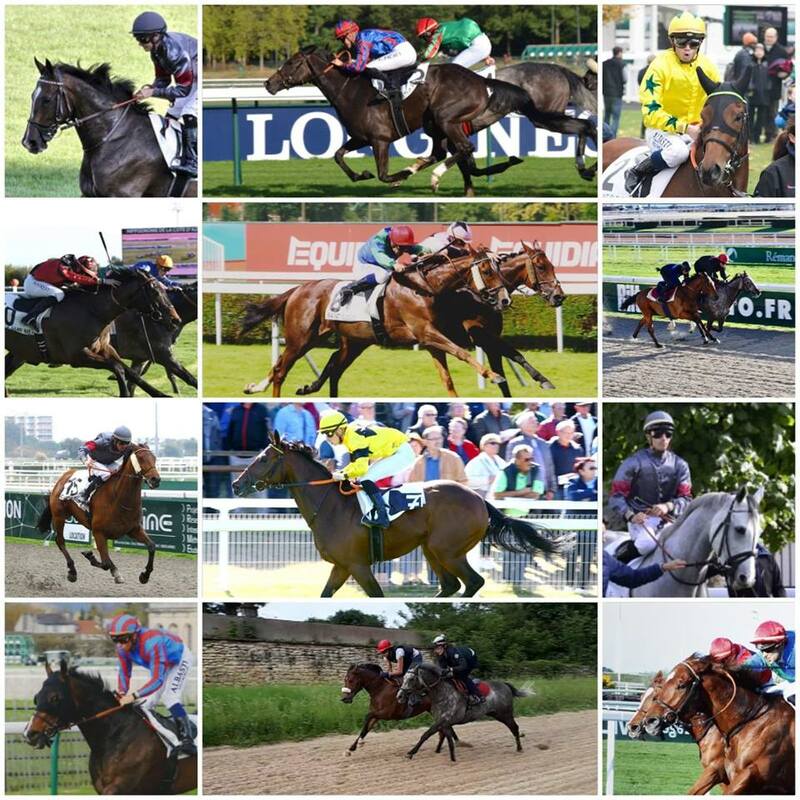 So over the next year, let’s take all the money we can, and hope that France Galop can sort itself out so that next year when I’m writing my annual wrap, it won’t be an obituary for racing. We’re off to Cagnes-sur-Mer in two weeks to start the year with a bang, and after that, we have some very specific goals to reach. We need more winners and more black type next year. Stay tuned to see if we can make it happen! 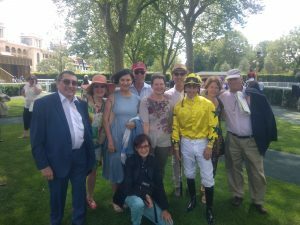 Réponse Exacte taking the Prix Mesnil le Roi in Maisons-Laffitte, June 16 2018. Réponse Exacte was the first winner for the new Avenue Marengo annex of Ecurie Rarick. The Rajsaman filly won from gate to post moving away from the field in the last hundred meters of the race. The Prix du Mesnil-le-Roi – Prix Rose Royal was run on the day of the Fete des Courses in Maisons-Laffitte. Several hundred people were on hand to watch the French national soccer team beat the Australians in World Cup play on jumbo screens. But all eyes were on the racing after the match was over. Michael Barzalona kept his filly away from the rail with his outside draw in this 1100m (5½ furlong) race but eased toward the rail in the later stages, pulling away from the others. Réponse Exacte went off as an outsider paying 13,10 for a one euro bet at the track and 16,30 online. Place bets were 3,50. The going was considered good to soft at 3.4. The time of the race was 1’05”79. Réponse Exacte is one of 8 two-year-old horses in the Ecurie Rarick annex from Ireland, managed by Lisa Gautier, running under the colors of Mme Catherine Hassett. The pheasant that could have ended my life this morning chose not to, for which I was grateful. Far away into my own thoughts, I didn’t see him preening alongside the trail until the last second – Hard Way was nearly on top of him, bowling along toward home in a huge extended trot. Too late to stop, all I could do was crouch lower to the saddle and hope he didn’t choose that second to fly off, which would have resulted in me flying too, probably straight into a stone wall. The pheasant stayed put, and Hard Way coasted past – he probably didn’t see him, either. The day I wheeled the hay steamer off the truck, you’d think I’d just brought in the first motorcar of the industrial era. A small group of curious onlookers crowded around the new, mysterious machine with a mix of skepticism and apprehension. Chantal, the landlady of our stable, immediately started pacing the yard. The machine would consume two things she holds most dear: Electricity and water. I continued to go about my work, and after the next lot, she had brought down her husband, Alan, to survey the situation and had read most of the instructions. “You’ll need a longer hose, too,” she decided. She spent most of the day fretting about how it would all work, and the next day our electrician friend came to install an outlet – and a meter so we could pay our share of the cost. “It’s not that big of a deal,” he said. “You mean I don’t need to build that nuclear power plant in the back yard?” I asked. Chantal, overhearing, stormed away. It was time to get started. We filled up the reservoir, put the first bale in the coffin, snapped it close and hit the button. An hour later, we popped it open to see the results, and they were impressive: The hay smelled wonderful and it was dust-free. Mark, an owner who also doubles as our yard man, took to the new machine with the fervor of Heisenberg. He set his cell-phone alarm for every cycle, calculated how many bales we’d need for the day, came up with a system of rotating them through and – most importantly – kept water in the thing so it wouldn’t burn dry. We were cooking. And I’m sure it’s a coincidence, but the day we started feeding steamed hay, the horses started running better. We sent out six runners in the week after we started using the machine, and every one of them made money. Now this is what we’re more used to around here, and we desperately needed it after a dismal run of luck. Fanoos started us off by hanging on to 5th place in a very hot condition race in Fontainebleau. She was only beaten a length and would have been closer if she hadn’t slowed down to watch the horses walking in the stabling area just next to the course about 200 meters from the finish. Gut Instinct followed up with fourth a couple of days later in Nancy, and then Hard Way won in Chantilly. It was the old man’s fourth career win and put him over the 100,000 euro mark in earnings. It also broke our losing streak. Just 20 minutes earlier in Craon, Alice’s Dancer finished 3rd in a Listed race, surprising us all. It was a fantastic run and fulfills our objective of getting some black type for her breeding career. Barbe a Box and Impulsive American rounded out the results, with both of them finishing fourth – Bbox in Lyon and the Imp in Maisons-Laffitte. So it seems that we’ve turned a page, at least for now. We still have some problems to solve, as usual, but the recent run has made everyone breathe a little easier. Even Chantal, who has been convinced that maybe the new machine is harmless. And apparently quite helpful. So it seems this blog is all but dead. My fault. Facebook’s fault. I resisted, in the beginning. I hated the idea of Facebook (not least because that was what the New York Times called their personnel directory, which seemed insulting and…well, impersonal). But a few years ago I cracked. My excuse was that I needed to be on Facebook for marketing purposes, which turned out not to be wrong. Facebook has been a useful tool for that. It also has been a colossal time-wasting addiction, but I digress. And it has also eaten my blog. Facebook, for better or worse, is an extremely quick and easy way for me to update anybody who cares or claims to care about all the comings and goings in the yard, the races, the results and just random tidbits (that would contribute to the time-wasting part). I have a pretty large following there, and I have been resorting to communicating that way instead of by blog, which some of you have actually noticed. To those of you who still check back here regularly, I apologize. And once again, I will try to do better. Meanwhile, if you’re not already signed on to Facebook, just do it. It’s really not so bad. And if you’re paranoid that signing up to Facebook will open your entire private life in every intimate detail to cyberspace, don’t be. Facebook only knows what you want it to know, so just don’t tell it anything. They don’t need to know your birthday, your address or anything else pertinent. You need an email address and a name. That’s pretty much it. Sign up, “friend” me (yes, Facebook has verbed the noun) and I’ll add you to the Gallop France group there and you’ll see everything that’s going on. Right, so some of you are still resisting. For you guys (all five of you, so I hope you appreciate it! ), here’s what’s going on in a nutshell: Hard Way has resisted retirement yet again, and ran a comeback race down in the country yesterday at the ripe old age of nine. He finished third of eight runners. I had hoped he would win, because to say the competition was weak would be the nicest thing you might say. But third still requalifies him for handicaps, and he probably needed the run after six months off. 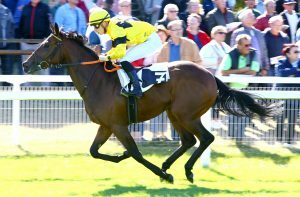 Despite rock-hard ground, he seems to have come back OK.
Gorki Park also ran his comeback race, finally, after nearly six months off, and he came 4th in a 20-runner handicap in Maisons-Laffitte. He looks like he should be just as useful this year as last. He’s grown up a bit and will stretch out in distance this year – if we can find him a decent race, which is easier said than done at the moment. King Driver, our other stable banker, is just back from a short break. He finished third at St. Cloud in mid-May, but chucked off his jockey (twice!) and ran loose for quite some time around the racecourse before he got down to work. That was him telling us as clear as he could that he was ready for a vacation, so he got one. He’s back in training as of tomorrow after having spent a month at the spa – a stud just north of us that specializes in massages and has a great water-walker to keep the muscle tone while on vacation. Melrand and Pahlavan also had short stays there, as did Risk Well Taken, an unraced two-year-old who went for two weeks after coming up with sore shins. Risks’s stay there was nothing short of miraculous – she came back nearly 20 kilos heavier and bulging with muscle. Our other unraced two-year-old, Impulsive American, was almost ready to debut when he picked up a virus of some sort, which will set us back a few weeks. Pahlavan and Ray of Hope also got it, but they all seem to be on the mend now. Charitable Act has been retired; his iffy joints were getting the best of him so we decided to stop while he was still sound enough for pleasure riding. Greatest has also moved on to greener pastures, but is still racing and just finished 2nd for his new connections. We wish him well – I always thought he was a good horse, but we were persistently unlucky with him. Clearly, a change was in order! La Mer seems finally on track after having just about every problem a growing horse can have. She is back galloping, and will hopefully run a maiden in Deauville in early July. Eternal Gift has finally come down in the handicap to a mark he should be able to win from, and he’ll get a try in Amiens on Saturday. Gut Instinct also should be able to win a small race soon, but she would be better on softer ground. She has some good entries coming up, though, so I’ll have to decide whether to brave the good ground or not. That rounds up just about everyone, I think. And reading back, I see the other problem Facebook has caused. Since I no longer write much more than a sentence at a time, it seems I’m losing the knack. I’d better get back to it, or I won’t be able to write that novel I’ve been talking about for the past two decades! I’ve waited years to finally get a winner at Longchamp, and this month we got two: Hard Way won his handicap two weeks ago, and Eternal Gift followed it up with a win last Saturday. Hard-working Deep Ocean was in the money again this past week, and King Driver ran a fantastic comeback after a year off to finish third. Grey Falcon dropped in a check, too, confirming that the yard is definitely in form. It’s been a whirlwind couple of weeks. Hard Way followed exactly the same pattern as he did last year: After his comeback race out in the country, he was ready to tackle Paris and found his favorite jockey, Christophe Lemaire, who rode a perfect race to give me my first winner at Longchamp. It was a 3,100-meter handicap, and Hard Way aced it carrying top weight of 60 kilos. His efforts got him back into the Bloodhorse magazine in America, with his longtime fan John Gilmore doing the honors. 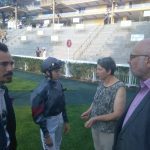 The next day, Grey Falcon stepped up in class and distance when he ran second division of the Quinte handicap in Maisons-Laffitte, trying 2,400 meters for the first time. He nearly wired it, just getting caught at the post to finish second by a short head. He has been really unlucky not to win yet, but he’s knocking on the door and it should happen soon. 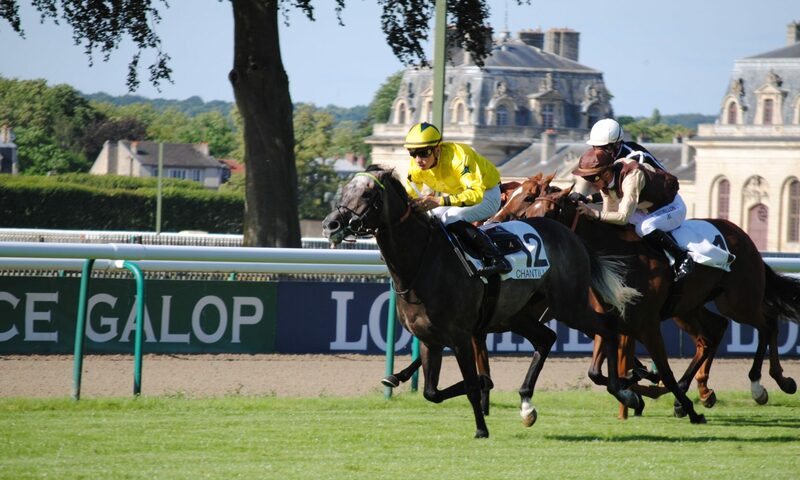 Eternal Gift finally stepped up his game at Longchamp last Saturday, winning a mile handicap by a neck. I knew he was progressing, and he certainly showed us that he preferred the good ground and galloping track of Longchamp to the muddy traffic circle he found in Amiens. It was his third race back after gelding, and I think he’s going to be a useful horse now. He picked up three kilos in the handicap ratings, which isn’t great, but he still has margin for progress. We barely had time to get him off the truck Saturday night before we loaded up Deep Ocean, Gold Knight and Not Bad for a Boy for the trip down to Vichy and the week-long racing festival there. Deep Ocean finished fourth in the Quinte on Sunday (we were all sure it was third, but there was just the shadow of a nose in front of him), but Not Bad didn’t distinguish himself in his claimer. It was his first race back in a year, though, and he has been a bit sore in the back, so he deserves another chance or two. Gold Knight showed quite a bit of improvement in his claimer on Monday. He didn’t get up into the money yet, but he did give us hope that we’re on the right track. The star of the week, though, was King Driver, who was coming back after year off almost to the day. He had some serious health problems last year, and I was never able to get him to his potential. He showed that those seem to be behind him now, though, running a strong third. It was a very easy field of 18, and he would have won if he had kept to the rail instead of coming out to the stands side. He is still very green, having run only six races in his life before Wednesday, and there was a good crowd at the track and it was a night meeting, so once he hit the front, he just looked at all the people rather than pay attention to racing. He has come back very well and is likely to run in Deauville in early August. In between the racing, I went to the Newmarket sales, where we found an addition to the yard optimistically named Greatest. He is a four-year-old gelding by Anabaa out of a stakes-winning mare, and he seems to want soft ground to run his best. So we’ll build him up and get him ready for a fall campaign. A half share in him is available, so contact us if you’re interested. Next up might be Hard Way and Grey Falcon on Thursday in Chantilly. I don’t particularly want to race them against each other, but they are in the second half of the Quinte handicap and there aren’t many runners declared, so it might be too good to pass up. In any case, I’m pretty sure Hard Way will go, but I’m still undecided about Grey Falcon, who might prefer softer ground. Hard Way is really a soft ground horse, too, but he doesn’t really care what he gallops on as long as he feels good and wants to run. Both will gallop tomorrow morning, and I’ll decide for sure then. All of the horses are struggling a bit with the heat, and storms are forecast for Tuesday, which might make the going a little easier. After that, we’ll gear up for Deauville in August, although we’ll probably have fewer runners than in July. Competition is tough there, and unless we have very good entries, it makes more sense to wait until September. In any case, the horses will tell me what they want to do. All I have to do is listen. It was busy at the end of last week with the La Teste sales and Birs in Lyon. First Birs: He finished 8th, but ran very, very well despite bad traffic. He was drawn 3, and Flavien had to fight with him to keep him from galloping on top of the other horses. (When you want the outside, you get the inside, and vice-versa, it seems.) Birs is a very, very big horse and wasn’t very happy inside. Once Flavien got him out, he galloped on to close nicely, and was only beaten about three lengths. In any case, the owner wanted him sold, so I made a deal with another trainer and he has now left my yard. He will run in Maisons-Laffitte next week, I hope, and I’ll still get the trainer’s percentage even if I don’t get to race him under my name. There are 80 entries, so we’ll see if he gets a run. He’s a nice horse, though, and one to watch. As for the sales, the quality of horses on offer from Osarus is better than ever and there were some very nice yearlings through the ring. One of my owners did a bit of bidding and came away with nothing, and it was frustrating not to be able to bring a couple home. 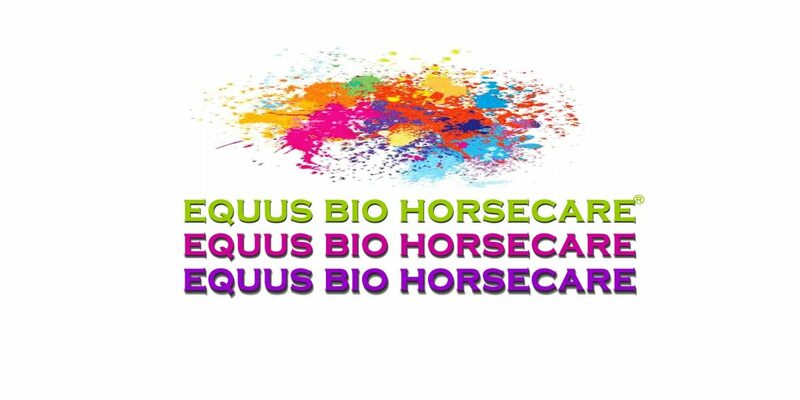 I particularly liked Lots 34, 78 and 93 – all very different styles of horses. No. 34 was a Layman colt who looked like he could race tomorrow. Very precocious and compact, he sold for 8,000 euros to Delcher-Sanchez, a trainer in Southern France or Spain – not sure which. No. 78 was a Great Journey filly, whose sister was a Listed-placed filly in Switzerland and France. She was a lovely model and went to Con Marnane for 11,500 euros, which means she is likely to come back to race in France (although I have no idea if she’ll come to me – my guess is probably not). My favorite horse of the sales was No. 93, a Carlotamix colt that went for only 11,000 to Michel Gentile. I figured he would have gone for a lot more, so maybe I missed a problem of some sort. Two of his three siblings are Listed winners and he was a nice horse, if a bit on the light side. The weak spot on the page, like it is for many French-bred horses, is the sire, of course. He did win the Group 1 Criterium International at St. Cloud, but didn’t do much else. He has eight winners from 45 foals of racing age, and he usually doesn’t get very good mares. France suffers from a lack of decent sires, but it’s a vicious circle because breeders aren’t willing to pay high stud fees. The highest stallions in France stand for 15,000 euros, and that’s peanuts compared with many other places; Carlotamix stands for 2,500 euros. In any case, it will be interesting to follow my three yearling picks to see what becomes of them. The organization of the sales was excellent; the Osarus gang is the antithesis of the Arqana snobbery that goes on in Deauville. The Osarus team is very welcoming, and they put on free breakfast and lunch the morning of the sale, plus Champagne during the sales themselves (they’re not stupid – well-oiled buyers tend to drive up prices!). I’ll definitely be back. In racing this week, George (Email Exit) will go to St. Cloud for a handicap on Thursday. I really need to retire him and find him a new job, but since I haven’t really moved on that yet and he’s here, eating, cantering and seeming well enough, he can race until I decide what to do with him. Tuna (Fortunateencounter) will go to a claimer here in Maisons-Laffitte on Friday. She was entered in a handicap at St. Cloud on Thursday but didn’t make the cut, so we’ll have to take another risk. Rue B. is entered in the same race, but I don’t think we may wait for a better chance for her. We’ve had three horses in the money over the past week: Hold that Emperor was 4th in Maisons-Laffitte last Wednesday, Justthewayyouare ran a very nice third in Deauville on Thursday, and Talawa was third today in Aix-les-Bains. Panisette was unplaced last Tuesday at Compiegne, but showed a lot of progress since her last time out and should do well next time, which will be at the end of this week. Layman’s Terms, on the other hand, was disappointing in Maisons-Laffitte, but she doesn’t do herself any favors with her antics in the starting gate. She loads fine, but the minute she’s in she rears. I don’t know how to fix this; putting her in the gate for more training will only wind her up more and is dangerous for everyone. Once she settles down, she will be a very useful horse. This week, Rose Fleur will run in Deauville on Wednesday. Panisette is likely to go to Clairefontaine on Thursday and there will be two or three runners in the claimer in Deauville on Friday. I’m away in Newmarket at the horses in training sale, so Con will be handling the logistics. The catalog for the sale seems pretty promising, and I’ll be looking for at least two horses for owners here and hopefully bringing back a few new owners who want to make money racing in France. It is a rare and wonderful thing to be watching a race and realize you’re going to win it before it’s even half-way through. Sotka jumped out of the gates in Maisons-Laffitte on Monday and never looked back, galloping off an easy winner by two and a half lengths. Ioritz Mendizabal didn’t even have to pick up his stick. Monday morning, when it was pouring rain, I thought we would have to scratch her. But then I went down to the track and found that the going wasn’t worse than soft, so we had to take our chance. I’m very glad we did. Golden Age, on the other hand, did not run well in her race. She looked fine cantering down to the start, but she never traveled a decent stride once they were racing. She seems fine, so we’ll have to put it down to the ground for her. She’s still not there in her coat yet, either, so she may just be having an off week. We have a quiet week ahead, with no runners until next Tuesday or Wednesday. Time to rest up, regroup and get ready for July.